At this time of looking back, memories and retrospect I want to share a wonderful experience I had a few years ago. I received an intriguing invitation: a workshop in making a death mask on Samhain with a small group! I didn’t have to think long and decided I’d definitely want to be there. We ended up being with 6 ‘wyld & wicked women’! Some had met each other before. At the time I only knew the hostess beforehand, so I had the privilege to get to know 4 wonderful women. First we had dinner at a beautiful Samhain-decorated table. We had a very yummy salad, delicious pasta with pesto and salmon, an exquisite quiche and very tasty pizza! The dessert was even better: heavenly cheesecake and divine pecan pie with vanilla ice-cream. We started by reading ‘The Charge of the Great Mother’ out loud. Everyone had placed an extra plate on the table for someone behind the veils. We shared stories about those people and animals while eating in their honour. Lovely stories about beautiful memories… Some put a smile on our faces, some made us get all teary-eyed. It was very intimate and touching; it felt as if I got to know the people and animals, as if they were really there, sitting with us. I dedicated my plate to my dad. I told about our special bond, about my childhood memories and also about his death. In the temple space we prepared everything for the workshop. We made the masks in pairs. One person was lying down, while the other one put plaster bandages on her face to make a very personal mask, a mask of our own faces. To protect our skin and to make the mask easier to release we covered our face with a lot of cream. I had a nasty cold, so I was a bit nervous whether I could persevere the plaster. I decided to put some straws in my mouth, so I had both nose and mouth to breathe. Still, it wasn’t easy! I started thinking a lot of “what-ifs”. That wasn’t going to help me persist so I went into a meditative state and that was the right decision. I did it! Then it was my turn to make a mask. I soon felt I was very tired and the cold didn’t make it any easier. 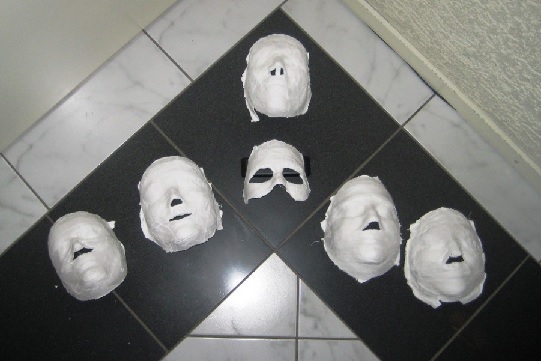 I wanted to finish the mask, so I kept on putting plaster bandages. I struggled. I realized it wasn’t working and felt so bad… Finally I asked someone else to take over. That was so hard, I felt I had failed miserably. In the kitchen I cried, but everyone was so kind and comforting! My mask partner got a beautiful mask nevertheless and she wasn’t disappointed (as I had feared). On the contrary, she accepted her own lesson in this with grace; we talked it over and hugged. Looking back now I can see it as it is: a wonderful experience for both of us, and a lesson too… I’m still very grateful for it. Afterwards we all talked about what making the masks had done with us. Generally speaking death-masks are made after a person dies. To do it on a living person can feel strange, especially when the eyes and mouth are covered. You literally shut them up… and the other way around your mouth is covered and shut. Although I had the straws in my mouth, it still felt like that. We shared our experiences and feelings. Meanwhile, it was very late so we set up the beds and dived in! I slept next to the veils in the temple space. In the morning we had a long breakfast / brunch together, closed the circle and said our goodbyes. On YouTube you can find several tutorials on how to make your own face mask, alone or with others.